Dream arrived on Sunday 27th April 2014. Went to his new home on Friday 9th May 2014 . Dream is part of his racing name and he's known it since being a pup. 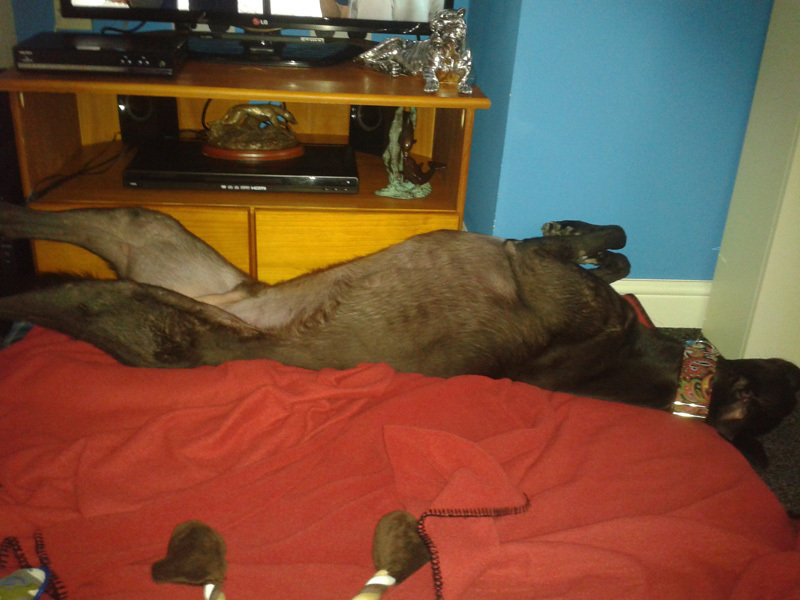 He is an ex-racing greyhound who is black with a white chest. Born on the 7th October 2010, he is microchipped and inoculated, has a nice temperament, travels well in the car and walks nicely on the lead. 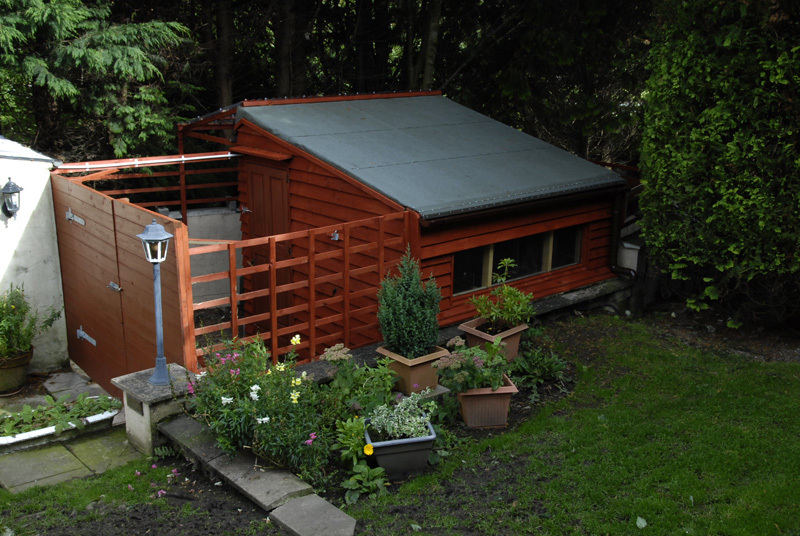 * The branch kennel at the bottom of our garden is where Dream and the other resident(s) will be for the first day or so until he gets to know the other greyhounds. He has use of our garden and paddock, and once he gets to know the other dogs he will be allowed in the house during the day and all the dogs will then take it in turn to sleep in the house at night, so they become use to sleeping in both the kennel and the house. 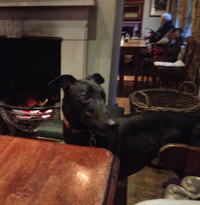 This afternoon Dream arrived and after his owner / trainer left we introduced him to the other greyhounds one at a time. This morning Dream went to the vets to be neutered. He weighed in at 31.6k and while in the waiting room he stood next to a cat in a cage that was making a noise and he ignored it. A couple visited today whose dog has recently passed away. 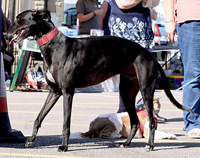 Having met the greyhounds and walking them they asked if they could reserve and adopt Dream. As they said 'Dream by name and Dream by nature' - says it all. 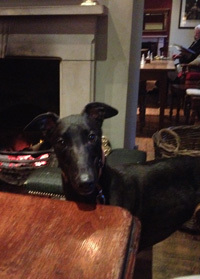 Arrangements are now in place to get everything he needs in readiness to adopt him later this week. 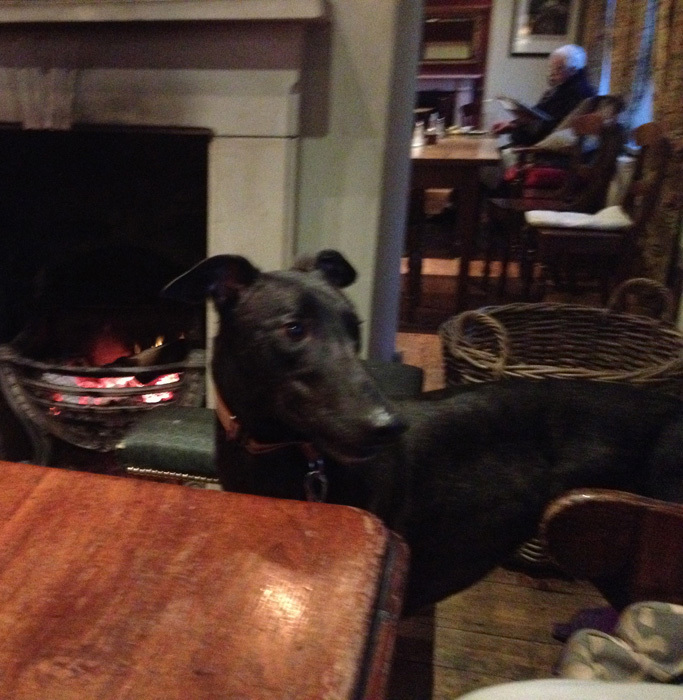 This evening we took Dream to our local pub because it is his last night with us before going off to his forever home. 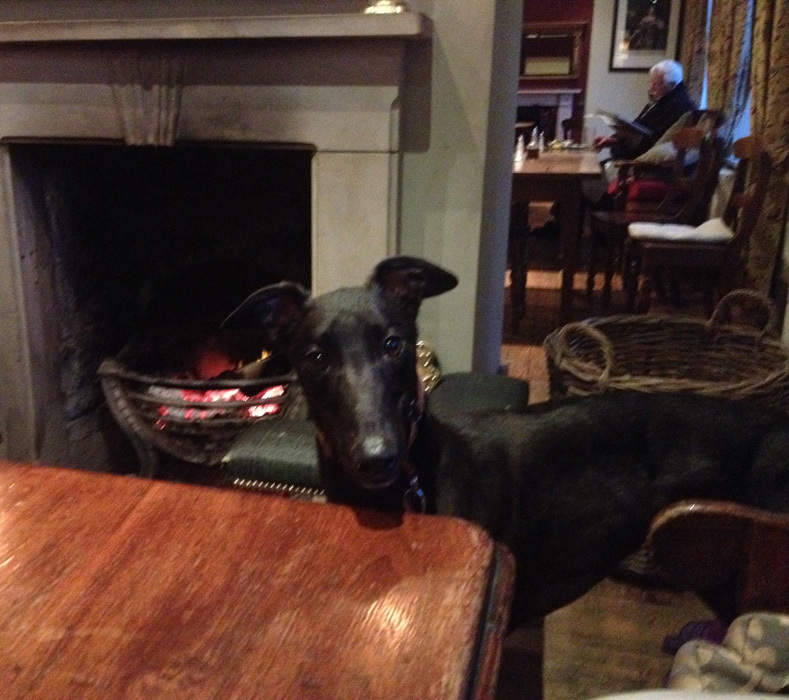 Dream, although it was his first time in the pub said hello to people as they came in, was relaxed and took everything in his stride. Think he enjoyed the trip out. This lunchtime Dream was adopted and went off to his new home where we hope he has a long and happy life with his new family. He wasn't too sure about jumping in the back of their car because of the space available so he went on the back seat where he was much happier and lay down for the journey home. We heard today that Dream is settling in well, he has made loads of doggy friends and is gradually growing his fan club when his new owners take him out. He plays with a ball and loves his squeaky toys. Dream and his new owners called in today with a bag of complete greyhound food that he decided he didn't like, and which made his stools very soft. He was looking well. 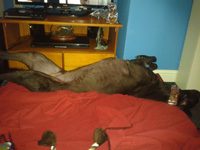 Having bought some tickets Dream won a session at a 'pooch' parlour where he was given a bath etc. The lady doing it had to ask for an assistant to help her because she couldn't do her work - he was constantly trying to lick her !!! All the children in their area love him, think his name is wonderful and he has quite a 'fan club'. He arrived today with a bandage on his front right foot, which he's to keep on for four days. He loves running and he'd grazed his pad badly when braking too hard after running to his owner for his treat. They couldn't stop him doing it and asked for advice on how to stop him hurting himself again. We suggested that as he came towards them they turned and walked slowly in the direction he was running, this way he would brake slowly because he was slowing to a moving person not one standing still. They met Alfie while out walking recently because he lives in the next village. They say Alfie and Dream are doubles!! 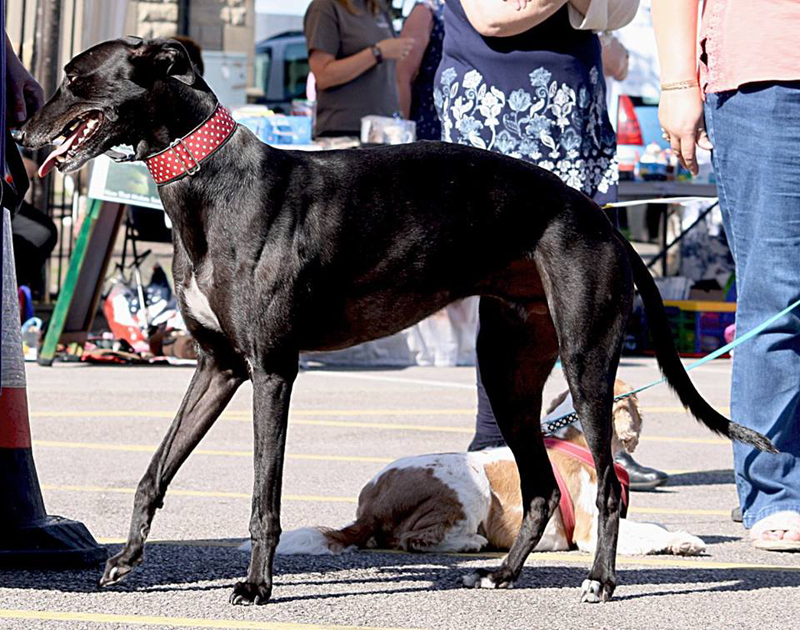 We received a Facebook message today from Dream's new owner saying they took Dream to a dog show in Lancaster, where he won 3rd prize in the class the judge would like to take home. Well done! We heard today there was a little meeting in Morecambe today to celebrate Wishes and Dougie's 1st year together. Anne who has Dream and Corni said it was lovely on the beach, 6 greyhounds all playing in the sunshine.